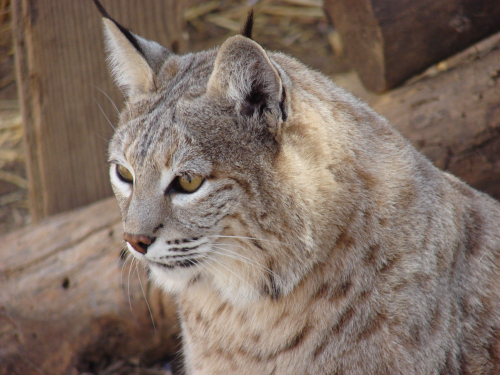 February 2019 - Beloved Bella bobcat has passed away. She was a favorite of our tour guests for nearly 20 years. She was always front and center to people-watch. Bella was also a favorite for people who wanted to sponsor (or adopt) an animal as a gift or in honor of a loved one. Bella was found by hikers in the Tucson area in 1998 when she was just a kitten. Thinking she was abandoned or an orphan, the hikers took her to the Arizona Game and Fish Department. 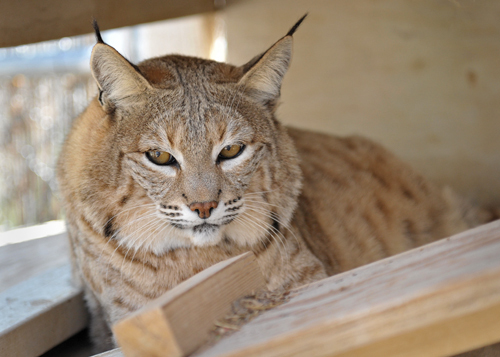 From there she came to Southwest Wildlife, where she was diagnosed with scoliosis of the spine. The diagnosis meant that she wouldn’t do well if released back to the wild, and Bella became a permanent resident at our sanctuary. As she aged, the curvature of her spine became more obvious, although it didn't seem to interfere with her daily activities until the last few years of her life. The many staff and volunteers who have known her for so many years will truly miss her.